Growing a business takes hard work – especially if you’re running it solo. Want to know what makes it even more complicated? Trying to manage your coaching business without systems. Business systems are a way to document the procedures, paths, or processes that you follow to complete certain tasks. These operational guides outline your expectations for how specific tasks should be done, giving someone with no experience at your business a step-by-step guide to follow. Business systems can be beneficial for companies of all sizes – even if you’re currently a one-person show. With systems in place, you can create consistency, scale more easily, and ensure everything is completed on time. Let’s take a look at how you can build systems in your business. What Systems Does My Coaching Business Need? Each business is different, so systems can look different from company to company. However, there are a few basic processes just about every business follows. Onboarding System: Outline the processes that each new client must go through when you first begin working together. Blog Writing: Create consistency among blog posts by double checking each piece is properly optimized. Blog Posting: In a separate system, document how posts should be uploaded to your website. Invoicing: Have a proper plan to guarantee each invoice is sent and paid on time. Client Coaching Calls: Maintain a list of items to cover, questions to ask, or points to make on each coaching call. Webinars: Include instructions on how to create, upload, and monitor webinars. Social Media Posts: Break down systems based on platform, including how and when to upload and when to respond to posts. Business Expenses: Explain how each business expense is to be paid, including paying for things like web hosting or webinar platforms. Newsletters and Emails: Describe how emails are sent, as well as what messages are sent on specific days. Appointment Scheduling: Have a clear process for how clients can schedule appointments, calls, or meetings with you. This is just a list to help get you started. As you find more routines that are important to successfully running your coaching business, you’ll want to create a new system that outlines the appropriate way to get that task done. What Should My Business Systems Look Like? There are a few different kinds of systems you may want to use when systematizing your business. Some of the most common are checklists, screenshots, and videos. Checklists are the easiest way to create systems for your business. They work best for simple processes that you need to follow, such as gathering information from a new client or double-checking that your blog posts are optimized. There are a number of different tools you can use to create your checklists. If you will use your checklists frequently or you’re looking for a special tool to help you track your progress, try an app like Process Street. However, you can also use Google Docs or Evernote to store your checklists. If you have more technical processes you need to follow, screenshots can work more efficiently than simple checklists. You can also mix a combination of screenshots into your checklists if some of the steps require further explanation. You’ll want to use a tool that allows you to add context and notes to your screenshots as well. Skitch by Evernote and Google Docs are both great for creating screenshot processes. Finally, video screencasts can help you explain incredibly detailed processes that would involve a number of screenshots. Screencasting can allow you to walk the watcher through the entire process while you provide voice commentary on what you’re doing. However, you should expect someone to watch your video each time they complete a process. Loom is a free tool you can use to create your video screencasts. You can then save and share links to these videos for you or other individuals to reference quickly and easily. Creating systems for your business may feel overwhelming, but they’re an important part of scaling and growing. Start creating your systems by building them one at a time. First, think of some of the most important components of running your business. What processes do you already follow on a daily or weekly basis? Make a running list of systems that are important to keep your business running smoothly. Next, determine which type of system would best explain that process. Will text and images be sufficient or would a video tutorial work best? The next time you complete a specific task, document each and every step you take – even if it seems minor – and use that list to decide which system will work best. For example, your system for how to properly optimize blog posts can probably use only text. However, setting up a new email marketing campaign may require screenshots or even a video. Finally, consider the various forms of software that you use. Each piece of software should have processes that explain how to use them. For example, if you use ActiveCampaign to send your email marketing messages, you’ll want to have processes that describe how to use the basic features of ActiveCampaign, how to create a broadcast, and how to set up an automated email sequence. Once your systems are complete, you’ll want to store them all in the same location. The location you choose will typically depend on the software you’ve used to create your processes. Try to use consistent tools for each. If you started your checklists in Process Street, store screenshots and video tutorials in Process Street as well. You’ll also want to revisit or add to your systems every so often. As you follow your processes, consider whether there are any steps missing or points you haven’t explained well enough. 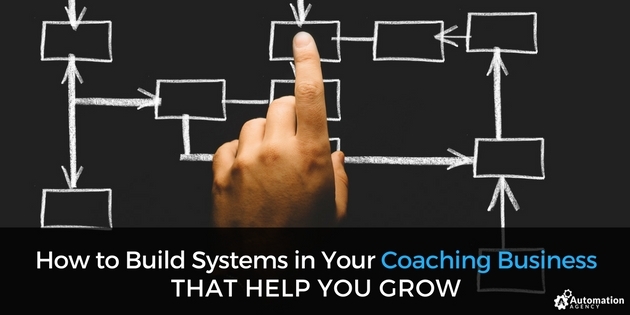 As your coaching career grows or changes, consider what new systems you may need to add. Finally, if you start documenting the in’s and out’s of your business and realize you could use a little help executing the design and technical tasks – we’ve got your back! As an Automation Agency client, you’ll have access to unlimited technical and design tasks done for you by experienced programmers and designers. We already train our team on tools like ActiveCampaign, Infusionsoft, Ontraport, Clickfunnels, LeadPages and more, so you can just focus on building your business and let us do the rest.